THE OLD BAKERY: Do go along to support and enjoy the open garden at The Old Bakery, on the corner of Solomon’s Lane and Eatenden Lane, on Sunday (9th September from 11.00 – 4.00) in aid of CLICSargent (CLIC stands for Cancer and Leukemia In Children). Attractions will be live music from local players (jazz/blues in feel), Barbara Valentine will be doing her speed portraits of children and dogs, plus a range of stalls selling all sorts of fun things like stained glass, pictures and plants. There will be teas, coffees, refreshments and cakes. Entry is £5.00 (to include a cuppa). Mountfield’s answer to the Chelsea Flower Show and Glastonbury all rolled into one. MOUNTFIELD COMMUNITY ARTS: Barbara and Juliette’s art classes start again on the 11th September, on Tuesdays and Wednesday mornings. Phone for details on 01424 838 264. MOUNTFIELD WALK & RIDE: Then, next weekend sees the Mountfield Church Ride/Walk (Sunday September 16th). 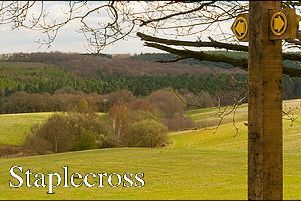 Almost entirely route off road round fields and woodland that are away from any public rights of way. Open to walkers (dogs welcome) or riders, the entry fees are riders £15.00 in advance (£20.00 on the day), under 16 riders £10.00 (£15.00), walkers £5.00. Pre-registration to lucinda@mountfield.me.uk. Riders and walkers may set off any time between 9.30 and 12.00 noon. All in aid of All Saints Church, Mountfield. FINALLY: Next week’s Village Voice will be our last.